You can find the email customization at the bottom left of your account under "Addons". 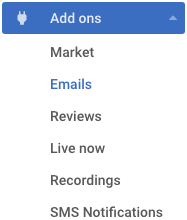 To enable it click on "Market"-->"Email Customization". At the top of the page, you pick the type of participant your want to customize your email for. An overview of the total number of notifications and the active or disabled notifications is also available. Switch to Audio by Phone: message appears when you (user) want to switch to the Audio by Phone option during the meeting (sent immediately). 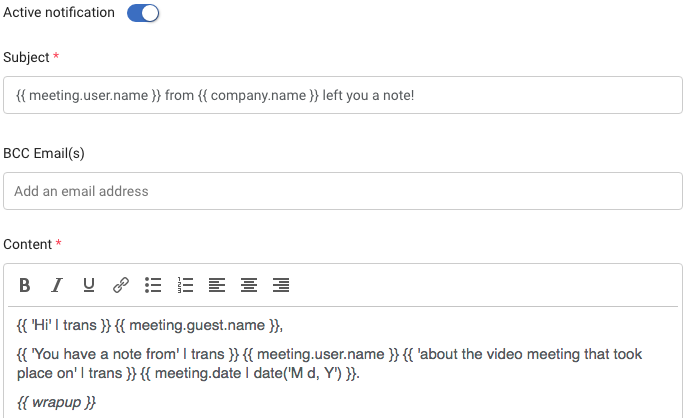 Wrap-up: user leaves a note to the guest of the meeting after the meeting has ended (sent immediately). Meeting canceled: email to inform that the video meeting is canceled. (sent immediately). Meeting rescheduled: email to inform that the video meeting is rescheduled (sent immediately). 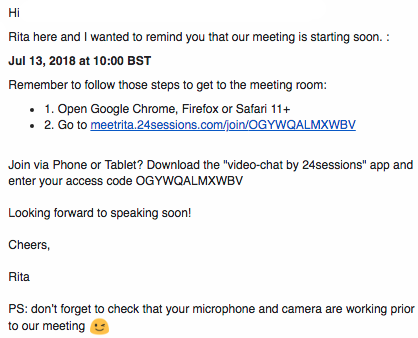 Meeting scheduled: email to inform that the video meeting is scheduled (sent immediately). 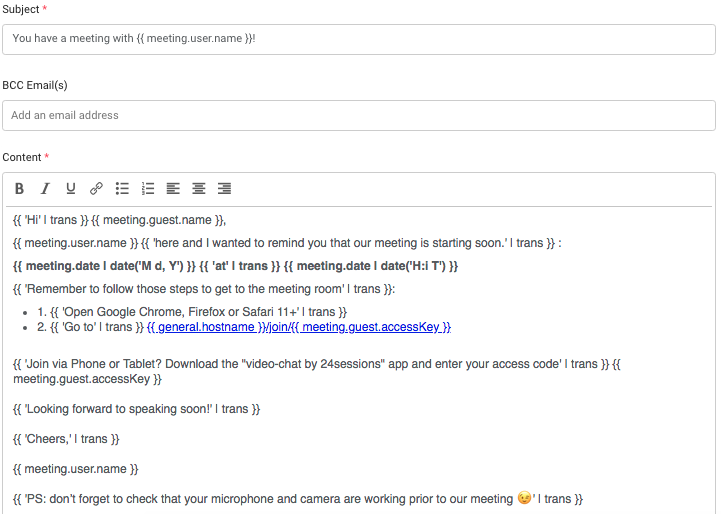 Meeting starts soon: email to inform that the video meeting is starting soon (sent 1 hour prior to the meeting). 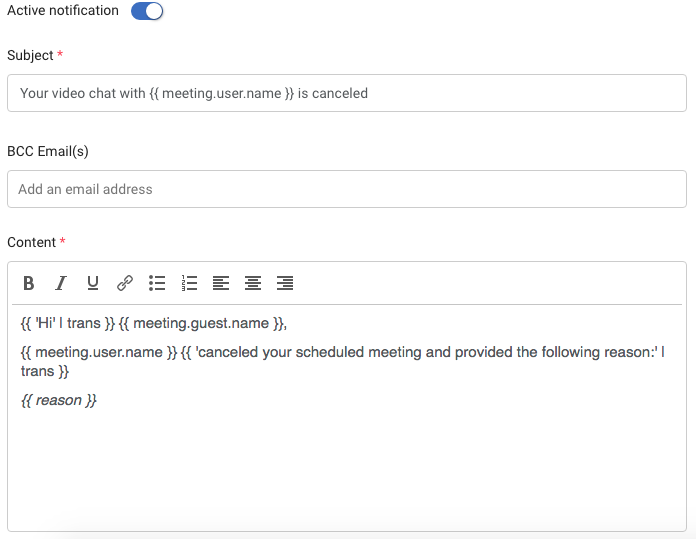 Review: email to remind your guest to leave you (user) a review. This email is sent only if your guest hasn't submitted a review in the tab that appears on his screen right after the meeting ends. How do I edit my email notifications? To do that you will need to use some dynamic variables and links that will let you generate messages populated for every receiver. 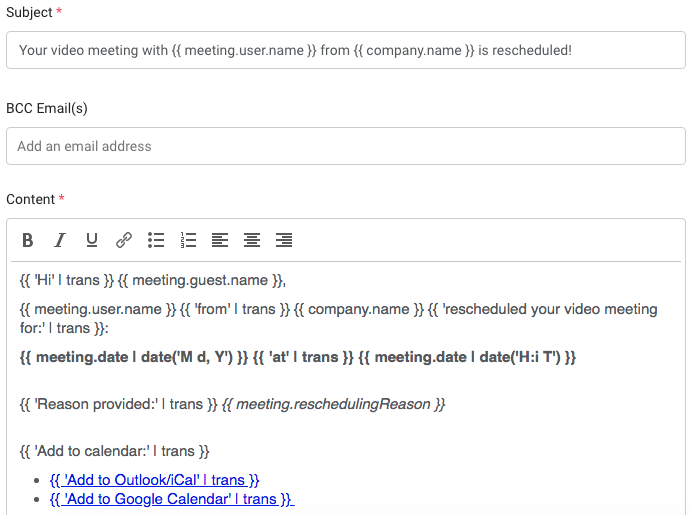 You can always click on reset and go back to the pre-set 24sessions email templates. User and guest notifications should be edited separately. If you only edit one, the other will remain as pre-set by 24sessions. For the moment we advise you not to upload attachments that surpass 25 MB. To further customize using HTML code go to settings at the top of the page.